Get comfy, grab a cup of hot cocoa, and let me apologize for this long, rambling, multi-part post. Highlighting and contouring has become such a fad, and it is the number one thing I am asked to teach. Countless YouTube videos and products are dedicated to this technique, but I have yet to find one of either that expresses my take on it. In this two-part blog, I’ll explain my version, starting with contour, in very broad terms. I’ll break it down further in future posts and videos. Contouring is the process of defining or creating receding areas of the face to give it definition. That’s it. Areas typically contoured are the hollows of the cheeks and eyes, down the sides of the nose, around the perimeter of the face, and down the center of the neck. I do some form of contouring every day because I like it, but I promise that you can live a very long and happy life without it. Where things start to get confusing is when we try to figure out the difference between bronzing and contouring. Bronzer is meant to bronze the skin as if you had been lying out all day and were bronzed (slightly reddened) by the sun, which as you probably know, happens on the high points – not the hollows – of the face. This is why I like to keep my bronzer and contour separate. So can you use your bronzer to contour? Absolutely. But I have a different bronzer for contour and one for bronzing. What the heck is the difference?!?! (Precisely why this is a post entitled “Mass Confusion”). It comes down to the undertones in the product. A product with more grey for contouring will create shadows, while a product with more red for bronzing will mimic what the sun does to your skin after a day at the beach. So can I use the same product as contour and bronzer?? Yes and no (insert hair-pulling): yes you can, but not at the same time. I mean, you can do whatever you want – it’s makeup – but have you ever seen people with what looks like giant brown rectangles on the sides of their faces? That’s what happens when contour and bronzer collide. 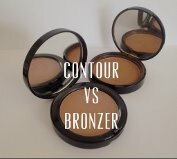 I’ll contour with my red-ish bronzer and forgo the contouring product depending on the look I want to achieve and how tan I am. I’ll rarely use a contouring product to bronze, though, because that’s where it’s really easy to get into muddy- or dirty-looking territory. Another option is to contour with one product and bronze with another, using the bronzer in place of blush (remember we still have to highlight, and there’s only so much room on the cheek, so while you can contour, highlight, bronze, and use blush, but that can be a bit much). A third option, especially if you want to use blush, is something I do commonly for special occasions: contour for definition, add blush and highlight, then set the highlight with highlighting powder (more on that in the next post), and lightly set the perimeter of the face with bronzer instead of powder. Here’s a video of this process. That’s enough for now. Take a deep breath, re-group, and I’ll meet you for Part II. May the force be with you.